I think it fair to say that Chris Lewis has had a different life to date. Sadly, people may remember him more for his comparatively recent jail sentence for smuggling drugs into the U.K. so his recent book, Crazy, in collaboration with friend Jed Pitman, is not only welcome but gives Chris the opportunity to put the record straight on his life. Chris's life has not been straightforward and he is the first to accept that he has not always helped himself at times with events on and off the field. However, as a talented all-rounder, he was good enough to score over 1000 Test runs and take almost 100 wickets and have the burdensome mantle of being the next great all-rounder thrust upon him. Alas, it did not always work out that way but what has impressed me about Crazy is how generous Chris is to others in his comments. For sure, a raw nerve is touched with some events - and with justification - but this is, I found, quite a moving and stirring book and comes over well. Chris does not look for sympathy for his mistakes. Chris represented Leicestershire twice, Surrey and Nottinghamshire although his time with Nottinghamshire did not work out. Although the years have dulled some of the media accusations which he mentions, I have to admit that I was perplexed at hearing the charges again. A colleague and I met Chris at an Emirates Airline event against The Lord's Taverners at Windsor Castle around ten years ago and found him a most pleasant man. We think that he kept wicket that day and, needless to say, did that rather well too. For someone who may have been misunderstood during his cricket career, the tone of Chris's book is admirable and, as I mentioned earlier, he is most generous in his comments about others. 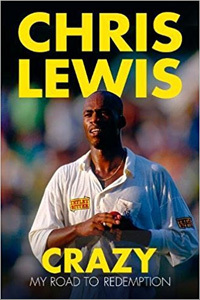 It might be easy to be bitter but this book is most understanding and will, one hopes, lead to a far greater understanding of this talented cricketer. It seems remarkable that the last time he played for England was in 1998. There is reason to believe that, with better handling of situations by others, Chris might not have taken the path he did which led to his incarceration. Hypothesis perhaps but again, to me, his sincerity comes through and he does not excuse himself for his actions. He feels strongly about the handling of his reporting of a match-fixing approach in particular. Equally illuminating are the chapters on his time in jail. The picture painted and the system in place may not be the normal subjects found in cricket books but are thoroughly interesting for their content. During his sentence Chris did much good work in helping people with drug problems and he has also added talents from other work which may benefit him in the future. The book ends with the views of Chris Lewis by Chris himself and Jed Pitman. I am most impressed by the tone of Crazy and hope that it will lead to a better understanding towards Chris Lewis. I would personally like to wish Chris all the best for the future.